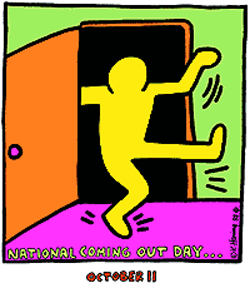 Shakesville: Happy National Coming Out Day! Today is the 26th (!) annual National Coming Out Day! Twenty-six years ago today, half a million people marched on Washington for LGBT equality and Coming Out Day was born. A lot has changed since then. And a lot hasn't. But what has changed, and what will change, is due to the brave men, women, and genderqueer folks who come out because they expect more than a closet. As long as we live in a deeply heterocentrist culture that privileges straightness, coming out will remain a radical act—and anyone who comes out is an activist and an advocate, sheerly by virtue of their public existence, because straight/cis people who know out members of the queer community are exponentially more likely to be political allies. The privileging of straightness also means that coming out is not a single day in a life, but a never-ending process of assessing one's safety and balancing it against the need for disclosure. Coming out to family, coming out to old friends, coming out to new friends, coming out at school, coming out at every new job... A series of comings out necessitated by a culture that reflexively assigns straightness until an individual demands to be recognized otherwise, a culture that arbitrarily and unnecessarily attaches meaning, and difference, to sexual orientation. There yet remain many places in the world, including lots of parts of the US, in which queer people do not feel safe coming out. As we mark Coming Out Day in this space, let us remember those people who have not come out for reasons of personal safety, or religious oppression, or out of a profound fear of familial or community rejection. And let us celebrate coming out, and the people who build spaces where coming out and being out is safe. I invite you to share your coming out stories here, as a road-map to the people who are beginning that journey, and an invitation to the party that awaits them when they arrive.